Lamp Counter: 1214 Lamp Hours used. Like new brightness. Used Sharp PG-F211X DLP Projector. Overheating - With a cleaned projector you can be worry free about your projector overheating. Dead Pixels - Little white/black dots is a common problem within a projector. THIS LAMP IS SOLD COMPLETE WITH LAMP HOUSING. Warranty: This unit has been tested and inspected by our technicians for Key Functionality (R2/Ready for Resale). This product is in Great Condition and tested for Key Functionality. THIS ITEM IS TESTED AND GUARUNTEED WORKING WITH WARRANTY. Lamp Counter: 1214 Lamp Hours used. Like new brightness. Used Sharp XG-MB50X DLP Projector. Overheating - With a cleaned projector you can be worry free about your projector overheating. Dead Pixels - Little white/black dots is a common problem within a projector. Projector has 1241 hours total. to ensure the projector is in factory working condition. The projector shows typical. This is a used Sharp XG-MB67X projector that has been fully tested and works fine. This has been tested via the VGA port and it is in good working order. The case has lettering in ink and has heavy scuffs. Includes working lamp and power cable. Unless otherwise stated, this has been tested for key functionality. This listing is for two new old stock projector lamps with housing. Please view the photos as they are part of this description. I ship ASAP after receiving payment. You are purchasing a Sharp XG-E650UB LCD Projector. This has been tested and working. Good used condition. Light wear from normal use. Includes everything shown. Has around 1000 hours on the lamp. Complete Generic housing assembly with g enuine factory o riginal Phoenix SHP bulb inside ! Factory Original Phoenix SHP bulb inside. For the Following Projector SHARP AN-K2LP. SHARP DT-400. This lamp is sold with Module and Housing included. 971h of 2000h used of full power lamp life. Has a few scuffs and scratches on the case that do not affect the functionality. Projector Size Sharp PG-A10X ProjectorSpecifications. Lamp Life Lamp Type. This projector is used and is in good working order. The power cable, signal cables and new lamp are included. Connections include audio, VGA, composite and S-video. Sold as pictured and AS-IS. 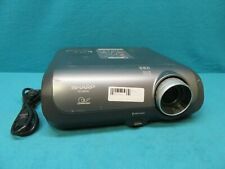 Sharp XG-C435X LCD Projector 1885 Lamp Hours. Condition is Used but in great condition. Powers on and image is very sharp. The left front leg is loose and will fall off yet still works. Projector Size. FOCUS LENS LOOSE. The COA (Certificate of Authenticity) sticker is located on the unit and has the Product Key needed to be able to load that OS on your unit. typically processed within 48 hours of closure. LOC UNDER PREP TABLE. The COA (Certificate of Authenticity) sticker is located on the unit and has the Product Key needed to be able to load that OS on your unit. this is not a defect in the unit. typically processed within 48 hours of closure. SHP119 RLMPFA 032WJ projector bulb AN-F212LP for Sharp PG-F262X PG-F312X. lamp model: SHP119 AN-F212LP. work with: for Sharp XR-H825XA XR-H825SA. We'll take on our responsibility and make the best effort to resolve the issue. These pieces are often used but in good working condition. A Lamp is a Bulb with the Housing attached. The savings are significant. Beware of others who hide the fact that you are purchasing a bulb only, and not the complete lamp with housing. Sharp PG-D3750W. I was able to power on and light the device using an in-house projector (Projector not included). Secondary functions not working properly or missing components are disclosed as follows Tested for Key Functions, R2/Ready for Resale.